One of the brilliant hansigurumi patterns by Hansi Singh. 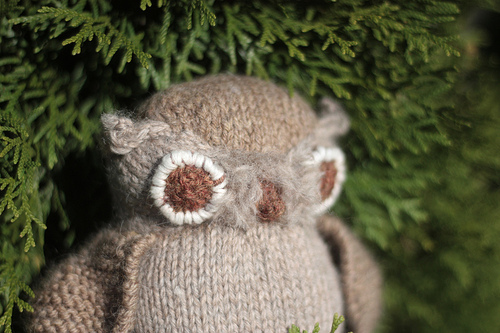 I knit this back in July as a gift for Lisa, my favorite owl lover. Knit in three colors of Knit Picks Wool of the Andes it took me way longer than it should have since I kept getting distracted. The knitting itself was not super time consuming and the construction was interesting (brilliant, really. Super neat uses for short rows) but I would have liked a few more schematics. This one would be okay for wee ones if you omitted his fuzzy beak fluff and the fluff around his legs, but since they’re not sewn in, it would be super easy for the very wee to pull them out and choke. Oh I absolutely love this. You tempt me to pick up my knitting needles again. Hvn’t knitted in 14 years!